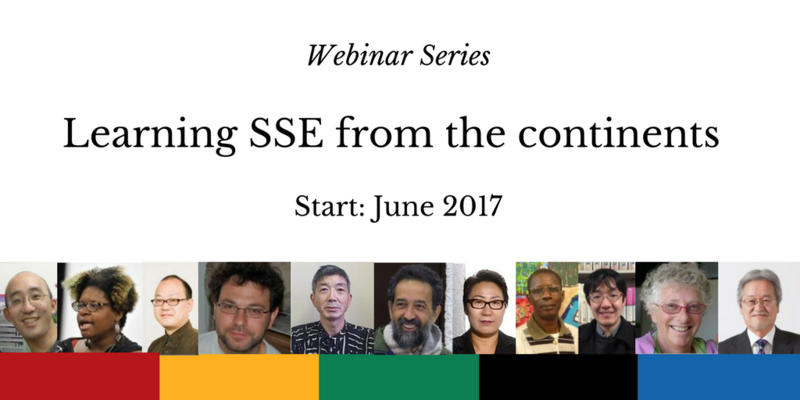 Starting from June 2017, Pacific Asia Resource Center (PARC) which is a member of ASEC/RIPESS-Asiabased in Japan, will host a webinar series “Learning SSE from the Continents“. What is it that comes across between movements in EU, Africa, Latin America, North America, Asia and Japan? In spite of the divers socio-economic situations that these places face, there is yet a growing movement of social solidarity economy that has something in common. What exactly is the vision that we all share? What are some of the challenges that are shared, and how can we all work in solidarity; overcoming the contextual differences that we face. This webinar series is aimed at finding hints to these questions by bringing aboard leading SSE practitioners/activists from EU, North America, Africa, Latin America and Asia and listening to the state of SSE movements in their respective continents, sub-regions, or specific countries. Most of them are working closely for the Ripess continental network they are belonging to. The aim is to broaden our standing of SSE by understanding better the circumstances of the respective territories and through that to better grasp the Global Vision of SSE that RIPESS has drafted. Speakers will speak to audiences in Japan through video conferencing software, and consecutive interpretations will be offered only into Japanese from the speakers’. In addition, some of the speakers will be speakers from Japan who will be only speaking to those physically present in the venue in Tokyo, Japan. However, international participants are welcome to join the webinars through video conferencing software to listen into the speakers give their lectures. Those attending must keep in mind that Japanese consecutive interpretations will cut in between, but the webinar part will be open to the international community, and any participation fees will not be collected. We aim at publishing some articles along this webinar series in order to highlight our common visions and the state of SSE movements over the world. Since bandwidth is limited, we do ask that participants register at least 1 week in advance. Please contact Shigeru Tanaka (alter@parc-jp.org) at PARC for further information and registrations.